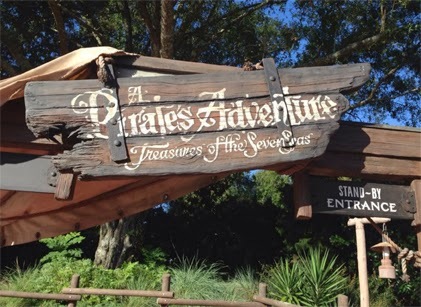 On May 31, the interactive park game A Pirate’s Adventure: Treasures of the Seven Seas began in Walt Disney World. Similar to Sorcerers of the Magic Kingdom, guests first go to an area called The Crow’s Nest and are given a map to find spots hidden in Adventureland of the Magic Kingdom on one of five searches for treasure: Heads You Lose, Guardian’s Curse, Haven Defense, A King’s Ransom, and Blackbeard. The adventures are based on the Pirates of the Caribbean series of films, including the characters of Jack Sparrow and Captain Barbossa. Any guest is able to play the game, and each mission takes about twenty minutes, although guests can stop and resume at any time. Posted in Uncategorized and tagged 2010s, Attraction, Disney Park, Interactive Attraction, Walt Disney World. Bookmark the permalink.